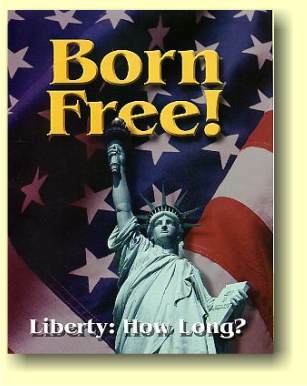 Restore >> Library >> "Born Free" (part 1).. 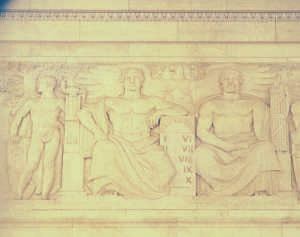 The USA Supreme Court building showing the Ten Commandments with bended knee covering first table of the law. 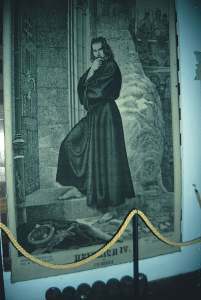 King Henry IV, to obtain reconciliation with the Pope, was required to travel to Canossa in Italy where the Pope made him stand outside, barefoot, in the snow before he was granted an audience and reinstated. 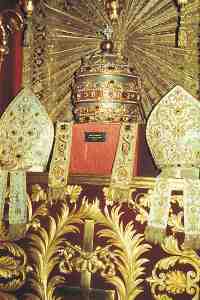 The abundance of riches, gold, and jewels associated the the rituals of worship. 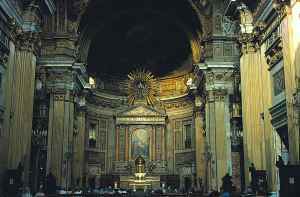 The magnificent altars associated with the confessional at the Church of the Jesuits. Implements of torture used on the Albigenses and Huguenots. 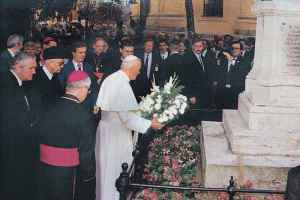 Pope lays a wreath in Hungary, and apologises for past mistakes. These are eventful times. With history-making changes passing rapidly before our eyes, questions press upon thoughtful minds in all lands. Whgat do these things mean? What is next in the program of world-shaping events? In this "Historical Series" we may see a foreshadowing of the conflict before us. The great events which have marked the progress of reform in past ages are matters of history, history that may soon be repeated. QUOTATIONS FROM JOSIAH STRONG.--In his first edition of Our Country, Josiah Strong, without access to primary sources, incorrectly referenced the statements attributed to Pope Pius IX. 14. 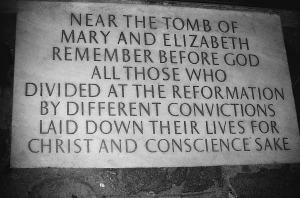 This shameful font of indifferentism gives rise to that absurd and erroneous proposition which claims that liberty of conscience must be maintained for everyone. It spreads ruin in sacred and civil affairs, though some repeat over and over again with the greatest impudence that some advantage accrues to religion from it. "But the death of the soul is worse than freedom of error," as Augustine was wont to say.21 When all restraints are removed by which men are kept on the narrow path of truth, their nature, which is already inclined to evil, propels them to ruin. Then truly "the bottomless pit"22 is opened from which John saw smoke ascending which obscured the sun, and out of which locusts flew forth to devastate the earth. Thence comes transformation of minds, corruption of youths, contempt of sacred things and holy laws--in other words, a pestilence more deadly to the state than any other. Experience shows, even from earliest times, that cities renowned for wealth, dominion, and glory perished as a result of this single evil, namely immoderate freedom of opinion, license of free speech, and desire for novelty. --As printed in Claudia Carlen, IHM, The Papal Encyclicals, 1740-1878 (Ann Arbor, Michigan: The Pierian Press, 1990), vol. 1, p. 238. 24. The Church has not the power of using force, nor has she any temporal power, direct or indirect.--Apostolic Letter "Ad Apostolicae," Aug. 22, 1851. 78. Hence it has been wisely decided by law, in some Catholic countries, that persons coming to reside therein shall enjoy the public exercise of their own peculiar worship.--Allocution "Acerbissimum," Sept. 27, 1852. 79. Moreover, it is false that the civil liberty of every form of worship, and the full power, given to all, of overtly and publicly manifesting any opinions whatsoever and thoughts, conduce more easily to corrupt the morals and minds of the people, and to propagate the pest of indifferentism.--Allocution "Nunquam fore," Dec. 15, 1856. --As printed in Anne Fremantle, ed., The Papal Encyclicals in Their Historical Context (New York: G. P. Putnam's Sons, 1956), pp. 146, 152. It should also be noted that the oath of allegiance to the pope, quoted in the last paragraph of the citation from Strong, was the bishop's oath, not one taken by cardinals. The errors corrected by the notes above were unfortunately not found until after at least two editions of Born Free had been printed. This magazine is continued in part 2.